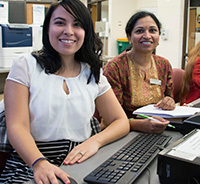 The MCC Undergraduate Research Scholar Program (URSP) is a college-wide program that provides unique and interactive learning opportunities for MCC faculty and students. URSP integrates undergraduate research into both the teaching and learning experience by providing support to students and faculty to pursue original research projects. Through URSP, faculty can recruit students to explore a topic of interest according the research standards of their particular discipline. Likewise, students who would like to develop their own research topic may also seek sponsorship from interested faculty members. Research topics must be original, and may include traditional inquiry methods, and may also include academic research within the applied arts (art, music, etc.) organized as an apprenticeship. 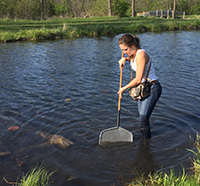 Megan Petersohn dipnets for dragonfly larvae in the Fel Pro conservation area pond in Cary as part of her dragonfly research project with MCC biology instructor Marla Garrison. Bianca Lopez enjoyed her URSP project "Family Life Trends: How race, gender, education and income affects the likelihood of divorce” with MCC sociology instructor Shiela Venkataswamy. Lopez plans to transfer to University of Illinois-Champaign and will major in sociology. 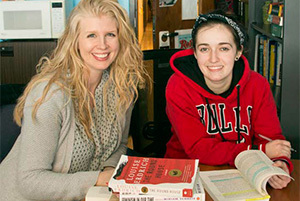 She plans to pursue a master’s and a Ph.D. and aspires to become the head of Student Affairs at a university.